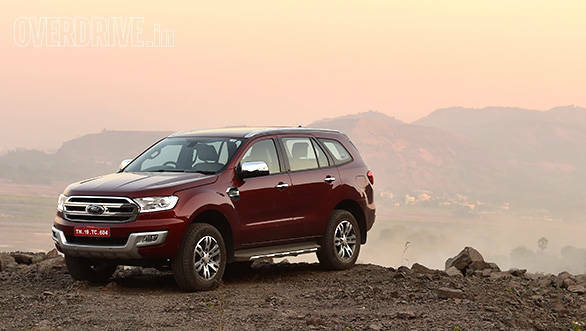 The Ford Endeavour may not have been overwhelmingly successful on the sales charts like its arch rival, the Toyota Fortuner. 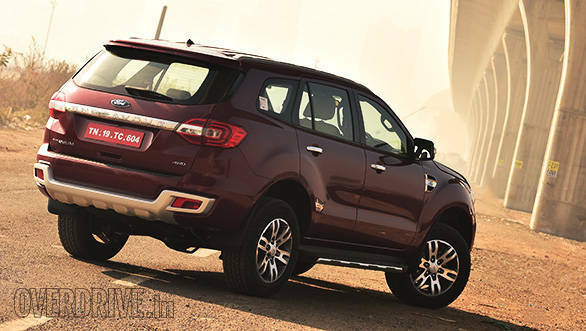 But over a decade ago, it kick-started the sub-Rs-30-lakh full-size SUV segment and became an instant favourite with anyone and everyone who believes that size matters to make an impression. Politicians, landlords, celebrities on a 'shoestring' budget and bodyguards alike - they all loved it back in the day. Of course, it could ferry families too, but in this car, their persuasion would appear more Mario Puzo than Rajshri Productions. And now, there is a new Endeavor and it uses the same formula that made its predecessor so popular - plenty of brawn. But can it deliver a punch to match that muscle? The boxy design and the typical tailgate mounted spare wheel are gone. Its a sleeker, more curvaceous SUV and like most of its modern counterparts, the spare wheel has found shelter under the tailgate. But despite all the rounded off edges and a sharper nose, the new Endeavour still looks like a broad rectangular brute approaching in your rear view mirror. And a stylish one at that. The grille takes centerstage in this regard and though smaller in size than its outgoing counterpart, it lends the Endeavor the air of a burly American SUV. The headlights gel with the grille and have a spearhead shape that encompasses a smart looking combination of LED daytime running lights and projector beam lamps. The slim roof rails and the soft creases on the bonnet and the doors add to the sleek profile of the car, while the massive skid plates, the large fog lamps and the pronounced wheel arches add the necessary muscle. Enough to make even the 18-inch wheels look a tad small. The glasshouse is narrow and gets a tapering window-line and little wings that flank the rear windshield. The latter is claimed to aid aerodynamics. In fact, the Endeavor boasts a drag coefficient of 0.38, which makes it more aerodynamic than a Nissan GT-R R32! But this isn't an SUV with sportscar ambitions. It rates space and practicality high and that is evident the moment you climb into the cabin. The doors shut with a heavy thud, highlighting the robust nature of this SUV. The grab handles on the A-pillar add to that effect. The driver's seat is big and can easily accommodate a person with a large frame. It gets electrical adjustments too. The steering wheel though, is only adjustable for rake and not reach, which is surprising. Most of us did not have trouble finding the right driving position, though. In a premium SUV like this, I also expected to have keyless entry and go, but the Endeavour sticks to conventional key-in ignition. Save for these two downers, the Endeavour's cabin is quite a pleasant place to be in. The leather upholstery on the seats and dash lends a sense of class to the cabin. 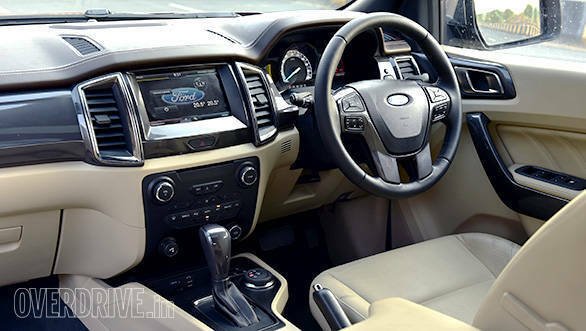 The design of the centre console isn't as bold as an EcoSport and sticks to a simpler layout instead. I would have liked to see lesser switches though, especially since the touchscreen infotainment is expected to be standard across the range. The knobs and switches have a soft feel to them and the subtle chrome treatment makes the switchgear look and feel upmarket. The plastics used on the lower sections of the dashboard and on the grab handles feel a tad rough on the edges, but the difference isn't contrasting. Move over to the second row and you will be impressed further. The 2+1 layout is adjustable for reach, thus allowing for a good amount of legroom and knee-room for average adults. Three can sit abreast and under-thigh support is decent for the isle seats. The third row isn't too bad, but a knees-up seating position for adults can make long distance journeys cumbersome. The dark shade for the roof upholstery robs some of the airy-feel and the effect is amplified at the third-row. The overhead air-conditioning for the second and third rows gets flush mounted round vents which channel the air quite well. The vents on the dash though could have done with a better design as the steering wheel obstructs the airflow from the vents on the driver's side. The touchscreen infotainment is quite a feature-rich unit for this class. Apart from the regulars like Bluetooth telephony and multi-format audio compatibility, it also gets an Internet hotspot capability that uses a data card or your phone's data network. The instrumentation is quite new age too. It gets a large speedometer flanked by two digital display panels. The one on the right provides readouts for the trip information and a digital speedometer and tachometer, while the panel on the left displays music and phone info. The two displays get individual selection switches on the steering. I like this split functionality as you don't need to navigate through too many menus to get the info you need. The car also gets a 12V socket each for all three rows and the middle row gets a three-pin plug point. Most of these features will be standard across the range. It is also the only SUV in its segment to offer an automated parking assist which will do the cumbersome steering for you in a tight parking spot. On the range topping trim that we have tested here, you will also get seven airbags, which puts the Endeavour on a higher pedestal than its competition. The bigger safety net though, comes from the various electronics that govern the dynamics of the Endeavour. ABS is one of them. Anti-lock brakes aren't a new thing, but bringing a two tonne SUV to a halt with all-terrain tyres underneath, isn't an easy affair. During our test, the ABS worked exceptionally well on concrete roads as well as gravely or rocky patches off the road. The electronic brake-force distribution and the stability control complements it further. The stability control also works when cornering by controlling the torque feed to the wheels and by braking the four wheels individually to maintain balance. The system also make use of gyroscopic sensors to prevent the SUV from rolling over. High-speed stability is exceptional. The steering is light at city speeds and weighs up a bit at highway speeds. But I would have preferred more weight on it and better feedback too. 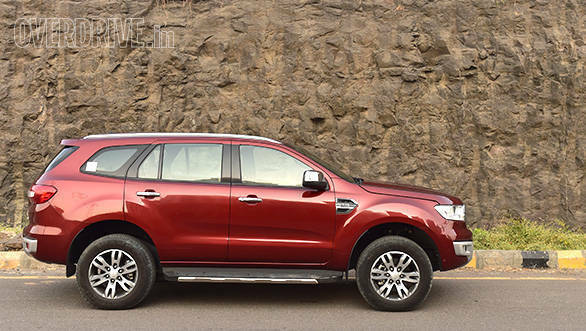 For better off-roading capabilities, the Endeavour continues to use a body on frame construction and a fixed rear axle. The 225mm ground clearance and the small overhangs contribute to that effect. 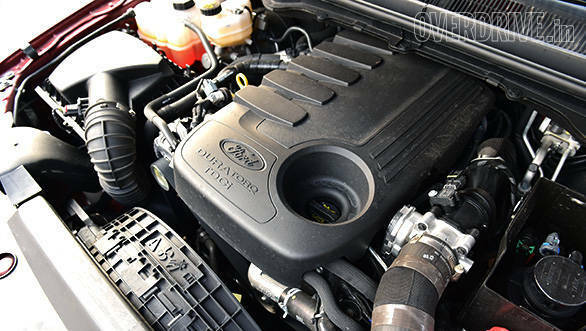 Ford has employed individual coil over strut suspension up front and coil springs at the rear. The conventional Panhard rod has been replaced with a Watts linkage system, which allows a more symmetrical body roll than the former as the axle is connected to the body through two separate linkage rods instead of one. The more important advantage it offers is better cornering stability without the need of a stiffer suspension setup. The setup works quite well. While body roll and nose is surprisingly low for an SUV of this sort, the ride comfort is easily the best in class (or even a couple of segments higher) even with a full house. And with no passengers onboard, the Endeavour doesn't bounce around like its predecessor. 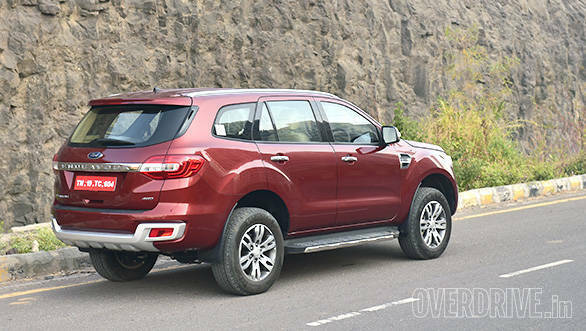 The Endeavor will come with two engine options - a 3.2-litre five-cylinder unit and a 2.2-litre four-cylinder mill. A 6-speed automatic and the 4x4 drivetrain is offered on both the variants, but the 2.2 can also be had with a manual transmission or a 4x2 configuration. The 3.2-litre also comes with different terrain modes to optimise driving performance in snowy, sandy or rocky terrain. Both the engines idle between 750-800rpm and while they are clattery on the outside, you can hardly hear them on the inside. That is partly because an array of mics inside the cabin assess noise levels and the system plays low frequency sounds from the speakers to negate the engine hum; and partly because the car has exceptionally good sound deadening. In fact, wind noise from the wing mirrors only creeps in after 150kmph. Both the engines produce healthy power and torque figures, but while the 2.2 feels a tad quicker at low revs, the larger 3.2-litre unit has a better mid-range. The two manage to hit the ton in 14.3s and 11.03s respectively, which isn't blisteringly fast for this category. But the culprit is the 6R80 automatic transmission. Despite a torque converter, it has a rubber band effect like a CVT. Ford claims it is one of the best gearboxes they currently have and the tech behind it explains it. The gearbox works closely with the onboard computers to detect your driving style and the terrain you're driving on to provide optimum performance. It works in some cases - like urban driving and off-roading; and doesn't in some others - like driving on crowded highways, where the gearbox grinds the same gear for far too long. But since the torque is spread out nicely, the engine never feels out of breath. But it does take a toll on the fuel economy, which is generally in single digit figures for both the variants. Cruising on the highway at 100kmph in top gear takes a mere 1,500revs for the 3.2 and about 2,100rpm for the 2.2. Off the road, the healthy torque spread makes itself more evident. A slight dab on the throttle is enough to scale rocky terrain. In fact, it is only in extreme situations that you will need to employ the 4x4-low. But we'll talk about that in detail later. The Endeavour, as I mentioned earlier, implements its predecessor's formula of employing plenty of brawn to attract its audience. But this new model also brings along plenty of brain to complement its muscle. From safety systems to the way the drivetrains behave, the Endeavour is a modern-day SUV in every respect. If priced right, it has the potential to shake up the Fortuner and reclaim the throne. Of course, there is the new Fortuner which is being readied for India and that is where the battle will truly unfold. But until then, the turf is in favour of the blue oval and we hope they make the best of the opportunity.